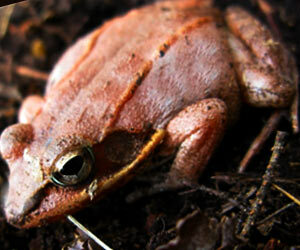 Stinky frog's skin produces a variety of anti-bacterial substances. These substances hold promise for becoming novel weapons in the battle against antibiotic-resistant infections, report scientists. Their research on amphibians so smelly (like rotten fish, for instance) that scientists term them "odorous frogs" appears in ACS' Journal of Proteome Research. Tree frogs have specially adapted self-cleaning feet, scientists have discovered. Scientists have discovered proteins in frog skins which could serve as a potential means to treat cancer, stroke and transplant surgeries by regulating the growth of blood vessels.